Close to the “Four Corners” area of the US, Mesa Verde National Park lies in southwest Colorado. The park offers great panoramic views of the surrounding valleys, especially from Park Point Trail, which has the highest point in the park. Unlike every other National Park in the US, Mesa Verde is unique for being culturally significant more so than for its wildlife or natural landscapes. The park is home to cliff dwellings that are archaeologically important and helped give the park a UNESCO World Heritage Site listing. Today, you can obtain park permits to visit some of the cliff dwellings on guided hikes, but there are nine other nature trails available to explore the area that do not require permits. Ranging from less than a mile to 7.8miles in length, each has its own unique characteristics. Some trails bring you to areas to see the cliff dwellings from a distance, while others highlight the plant life of the area, or show you ancient petroglyphs. Mesa Verde is a huge park, at more than 50,000 acres in size, so it takes some time to wind through the roads and trails to get an appreciation of what living here must have been like for the Anasazi people who lived here as early as 400AD. One hiking trail that helps you get a good idea of the vastness of the park and isolation that the Anasazi lived in is the short Park Point Trail. Located close to the Visitor Centre off of Highway 160, Point Lookout Trail is one of the most accessible trails in the park, although it is located off of a service road, so some visitors tend to overlook this little trail. It’s a moderately steep trail in parts, with a slight elevation gain. Along the way, you’ll pass brush lands and stunted vegetation, along with some junipers. The path is well maintained and has a number of lookout points to soak up the scenery from the valleys below. As you get closer to the top, things flatten out a bit. 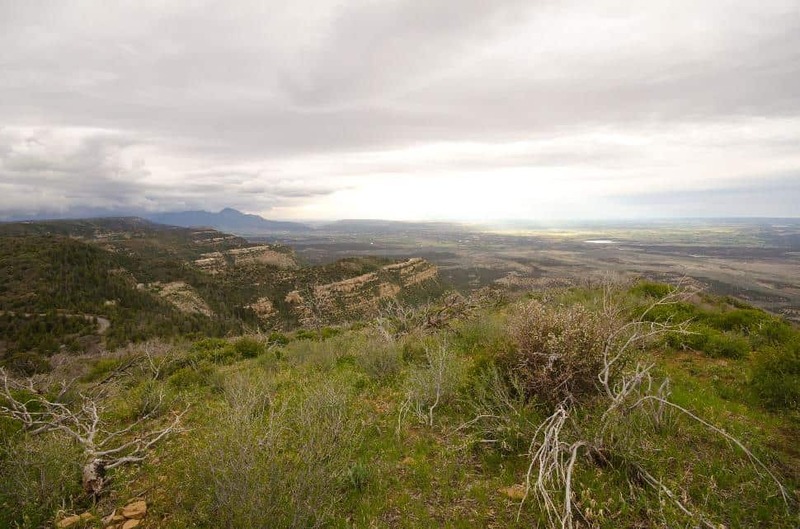 Great views of both Montezuma and Mancos valleys are seen from this trail. 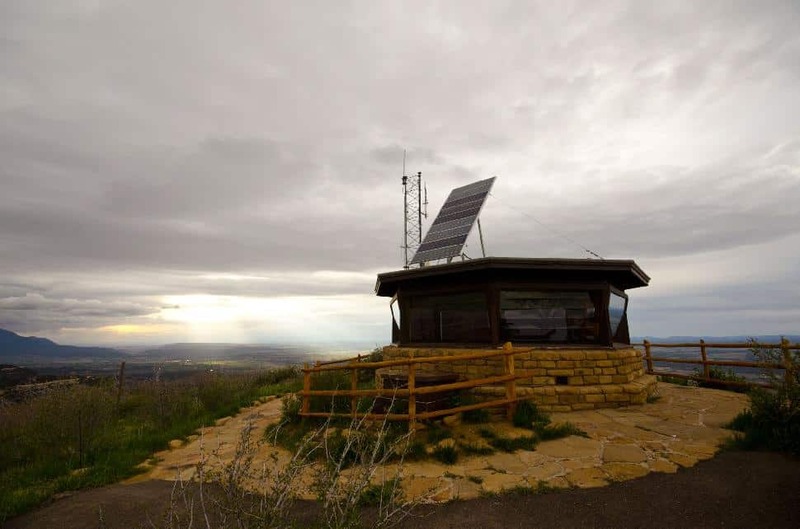 Atop the peak is a ranger station and the views are impressive in every direction. 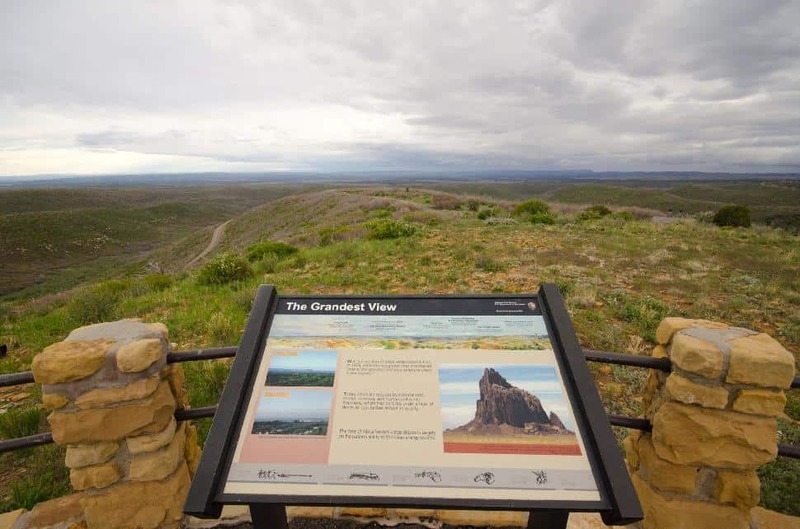 On a clear day your eyes can take in views of the Four Corners states – Utah, Arizona, New Mexico and Colorado. There is an interesting interpretation sign showing how views today are often impeded by pollution, compared to views enjoyed 100 years ago, or on very clear days. Save this little hike for a day with clear skies! It’s also a great spot to hike up to during sunrise or sunset times, as the lookouts face in various directions. Just remember it can be a bit cool 9and windy1) during those times of day. 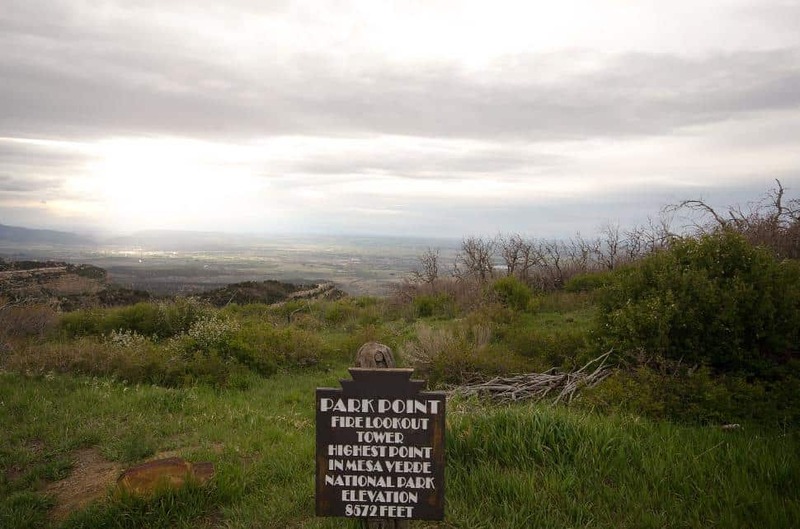 This park trail isn’t always mentioned on the Mesa Verde website, nor is it in some of the Mesa Verde literature, so get yourself a good trail map or just pay attention when driving on the park road. If you reach Morfield campground from Highway 160, then you’ve gone too far. Some people confuse this extra trail with that of the longer Point Lookout Trail, which is also great hike, with a steeper incline but great views.